A few days after Draco and Hermione&apos;s lonely time, Draco had something to tell Hermione. He knew things would get heavy, but he had to. For her. He found her in the manor&apos;s library, she used to sit there alot these days. It reminded her of Hogwarts, her home.
" Mione? I need to talk to you"
Hermione looked up from her book, and smiled when she saw him. " Talk honey " Draco sat down next to her and took her book away so she had all focus on him.
" I have to do something. Something very important " Hermione frowned and nodded slowly. " Okay...? And..?" " I have to go away for a while " Hermione&apos;s eyes widened and she got pale in her face. " A-away? " she stuttered. " Where?" Draco shook his head and took her hand. " I can&apos;t tell. I&apos;m sorry "
Now she changed the color in her face again, but this time it was like Weasley&apos;s hair. " Stop doing that!" She hissed. " What?" Draco said, utterly confused.
" Breaking my god damned heart!" Draco felt like he was taking out her heart, stabbing it and throwing it away. But he didn&apos;t want her to feel like that, he really didn&apos;t. " Hermione listen..."
" No YOU listen!" She shouted angrily. She threw a book into the wall and stood up. " You&apos;re just like everyone else! As soon as I open up my heart to someone, and actually starts to love the person..."
" You love me?!" Draco said shocked.
" No!" She immediatley took that part back.
" Well I take it back because you&apos;re leaving me anyway!" Hermione hurried out from the library, and Draco followed. The half house was heard by Draco and Hermione&apos;s voices. Mostly Hermione&apos;s. Even Lucius and Narcissa was starting to get worried.
" I promise I will be back!" 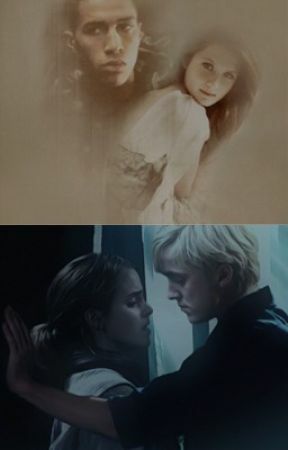 Draco promised and tried to reach for Hermione&apos;s hand but she rejected him.
" This is just what Ron did! He made me open up for him and when I trusted him the most, he broke up with me "
" Hermione I&apos;m sorry. I didn&apos;t attend to look like that. I want you to trust me on this!" " How can I?!" Hermione yelled.
" You have to! I&apos;m doing all this for you. You&apos;ll see at the end" Hermione laughed in his face.
" Do you hear yourself Draco? &apos; Oi Mione, I&apos;m leaving you because for your own good. Don&apos;t worry you will be happy in the end&apos; "
Draco realized that what just what it sounded like. But he wouldn&apos;t give in now. " Hermione, I don&apos;t care what you think right now. But you have to trust me on this "
" What if something happens to you?! And where will I live? Alone. In the muggleworld?" " I&apos;ve already talked to my parents. They already treat you like the daughter they never had, so you can stay here "
" With all respect Draco, but it will feel super awkward if you&apos;re not here too. I&apos;m going to stay in the muggleworld wether you like it or not!" " You really think I&apos;m weak right? " " That I can&apos;t do anything?" " That I need a body guard all the time?" " I&apos;m afraid of losing you!" Draco screamed and pushed her against a wall. She hit her head and fell into Draco&apos;s arms. Draco felt her warm tears against his clothes. Soon he started to cry as well.
" I&apos;m sorry Hermione. I didn&apos;t mean to hurt you "
" I hate you so freaking much Draco" Hermione cried silently. " I hate you so much it hurts " Draco sighed and kissed her head. He knew what the word &apos; hate&apos; actually meant in this case.
" I love you too, Hermione "